With so much hype about CBD cropping up in today’s headlines, what is CBD and how can it help humans and some pets? Medical marijuana and medical CBD are distinctly different terms with divergent applications, sharing the same origin from the cannabis plant. Cannabis plants are cultivated for either recreational use (which can include the presence of THC- “tetrahydrocannabinol” –that psychoactive component that produces a “high”) or for the hemp fiber from the stems of the same plant. Various strains of the cannabis plant, grown with specific, intended uses, are referred to as “cultivars”. This includes industrially-grown hemp; grown for its high CBD concentration, without the high-producing “THC” element. The 2018 Farm Bill has legalized hemp production for cannabis products with less than .3% THC. While CBD was formerly included in the category of a “Schedule 1 controlled substance”, this sweeping legislation has rescheduled (some) cannabis products and will pave the way for CBD enthusiasts, growers and consumers to experience the benefits of CBD-only consumable products, without the legal stigma. CBD: cannabidiol (pronounced kan-a-buh-dial) is a natural, organic cannabinoid component found in cannabis plants. CBD is a phytocannabinoid originally discovered in the 1940’s and represents 40% of the cannabis plant’s extract. Terpene: the scent of the plant is referred to as a terpene. Terpenes are found in all plants, flowers vegetables and herbs and may have unique healing properties by themselves. More than providing a distinct smell, terpenes are attracting further scientific research for its therapeutic value when combined with CBD. NOTE: When you take a whiff of peppermint or lemongrass, your nose smells the terpenes “limonene” and “myrcene”. Hemp cultivars produce substantially less THC and higher levels of CBD. Unsanctioned production of cannabis cultivars with high CBD levels does occur for purposes of medical treatment rather than recreational use. In plants, THC and CBD are derived from their acidic precursors- tetrahydrocannabinolic acid (THCA) and cannabidiolic acid (CBDA). CBD has been demonstrated as an effective treatment of epilepsy in several clinical trials, with one pure CBD product (Epidiolex®) currently in Phase III trials*. There is also preliminary evidence that CBD may be a useful treatment for a number of other medical conditions. *In June of 2018, the FDA approved prescription use of Epidiolex, a purified form of CBD oil, to treat 2 specific types of epilepsy. Despite the discovery and application of plant-health benefits, utilized in Eastern cultures for 1000’s of years, the long-standing stigma and misunderstanding associated with “cannabis” has finally reached Main Street. “All cannabinoids, including CBD, produce effects in the body by attaching to certain receptors. The human body produces certain cannabinoids on its own. It also has two receptors for cannabinoids, called the CB1 receptors and CB2 receptors.CB1 receptors are present throughout the body, but many are in the brain. The CB1 receptors in the brain deal with coordination and movement, pain, emotions, and mood, thinking, appetite, and memories, and other functions. THC attaches to these receptors. So, is it possible then that CBD (by itself and without the THC element), can benefit our natural immune system by stimulating itself through these natural receptors inside our bodies? Coincidentally, dogs, cats and horses have been found to have an endocannabinoid system similar to ours. This does not mean, however, that these animals, nor any other mammal, should be given any product that contains measurable levels of THC (if at all). Do not get your dog, cat or horse high….including the fumes of second-hand smoke from a toke. 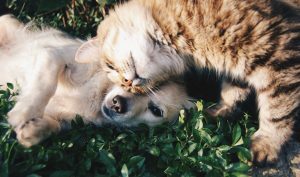 Many CBD-based products are now available for our pets and should be discussed with the family Veterinarian regarding its use, proper dosage, and potential benefits to treat certain ailments. CBD-based pet products should be viewed through the lens of alternative treatment options, with potentially fewer side effects than traditionally-prescribed pharmaceuticals. The specific pet ailments that seem to respond well to CBD products include acute pain, joint inflammation, mild seizure disorders and anxiety. 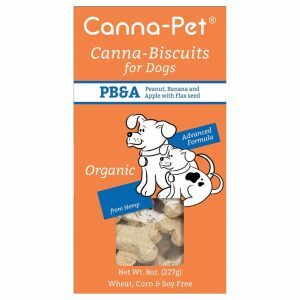 Doolittle’s Doghouse has added Canna-Pet products to our PET SHOP of recommended products @ https://doolittlesdoghouse.com/pet-shop/ based on the overwhelming positive results reported by our clients and endorsements by a highly-valued and respected Veterinarian we rely upon for professional advice. Many thanks to our clients and pet parents who have “weighed in” regarding their personal experiences and continued support of CBD products for their pets. Best wishes always for good health and happiness!